I did this one just because I wanted to! This image has haunted me most of my life; I've done renditions of it as embroidery, as paintings, and I've used it as the logo for my infant book publishing company. Now here it is as a print. 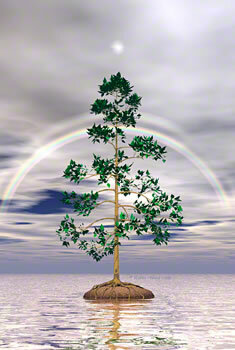 I used Adobe Photoshop®, Onyx Tree Pro and Bryce™ 3D to make this picture. It was the first thing I did with Bryce 3D, which was a new upgrade at the time, and I loved it!